For my onward restoration of J2353 into a J4 upgrade. I have already one autopulse fuel pump, what is the situation regarding a second one and manifold ? Was this an original setup ? Thanks. Chris J4 did not use an autopulse pump. Will give you details of the J4 pump set up when I see you next. Thanks Terry, I will pop over later in the year. What models did an autopulse get used on ? Hope you don�t mind me coming in, Chris. Certainly, the early K3s and, I think, the C types were fitted with autopulses. I am given to understand that they were not very good and it put me off even looking for them.Thinking about it, if they were good there would be a lot more available. They worked well but like al " first offs" needed care to keep them going..... just like the S.U.L type pump! Thankyou Chris, Barry and Terry , I have an autopulse pump, not sure yet what I will do with it in view of the information. Thanks. 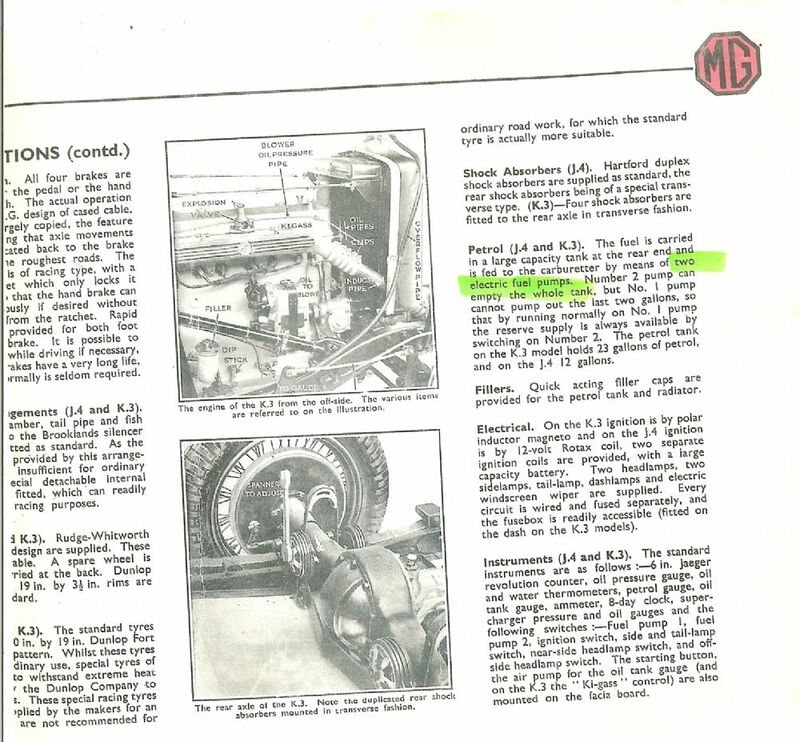 Noting your helpful comment comments Barry highlighting the Autopulse was the alternative to the Petrolift (which we know was not fitted to the J4), do you know if the Autopulse was was / wasn't fitted to the J4. It is not too clear from our response on this specific point. I have seen plenty of J4 recreations with the twin SU pumps mounted on the inner wheel arch panel. Was this the way the factory did this in the day. Sadly, I cannot find any original photographic reference to the factory installed arrangement although granted, there was no real set routine for all 9 cars in the wa they were prepped.. I realise that the Autopulse were unreliable, but there are ways around that now whilst still being able to utilise them. Any further comments would be really helpful as with my rebuild, I am going for the detail and I have previously used the twin SUs but I potentially have options now if indeed any of the original J4s left the factory with The early glass dome Autopulse units, similar to the J3, C and early K3s. ..from a mere mortal who is trying his best to get this right, I have in my possession an original J4 and K3 October 1933 Information Booklet, on the last page there is a description of the petrol pump..it says just that petrol pumps no.1 and no. 2. I have a works photograph probably taken in the same batch as the ones in your brochure which shows the autopulses fitted in the rear of the bodywork on the early K3s. I am away from home at the moment so can�t check to see if it was also in that brochure. This doesn�t prove that the J4 was so fitted but the wording in the brochure does insinuate that the J4 had a similar set up if not the same as the K3. These are my sentiments Chris. Terry, can I ask, what makes you so absolutely sure on this. I am aware you knew the Colin Tieche car well but this was just one of 9 cars produced in the day. We all know that it is highly likely no two J4s were alike in terms of specification, whether it be an engine turned dashboard, ENV75 gearbox with K remote, oil tank reservoir quick release filler cap rising through the bonnet top, and so on. The early K3 and the J4 both came out of the factory more or less at the same time in 1933. The C type had proved itself well on the track prior and had utilised Autopulse pumps and which the factory carried over to the first K3s. I have the photo also Chris showing inside the K3 rear body section. Great detail. I am also aware that these pumps could be troublesome but they were installed in production cars for many years right through to Porsches during the 1950s and possibly beyond. If the factory decided to move on to a better fuel pump system for the J4 then one could assume they would have also fitted it to the early K3, but they didn't until a little later in production. At the moment, it seems quite plausible that at least one or some of the J4's may have had Autopulse pumps installed initially. I am familiar with the twin SU pump arrangement and have run this system for years in one of my J types. I dare say some of the later J4s may have had this type of system fitted or, the uprated system could have been retro fitted to some cars where it had not been fitted as standard. The supplemental J4 manual pages are not helpful. The J3 manual has a dedicated section covering maintaining the Autopulse, so it may have seemed of limited value to cover in the J4 supplemental pages. No other publications of the day seem to be overly helpful either. This is not to say one way or the other what was fitted to the early J4s. If anyone knows the correct answer based on documented material as opposed to hearsay then this would be really helpful. Rich I was shown a photo many moons ago of what was obviously a period set up using two SU's on a bracket behind the passenger seat. This is the arrangement I have used on the cars I have built. I think it may have been Geoff Coles that showed me the photo - afraid I cannot remember at the moment. That is not to say that MG did not fit Autopulses to one or more of the 9 cars and it does not confirm that the photo I was shown was not of a car that may have been converted after a year or two. I doubt if we will ever know the answer to the question. The only info I have refers to two electric pumps with a changeover tap. It is quite possible that MG still had some Autopulse pumps kicking around about that time and decided to use up the stock but having heard so many bad stories about their reliability in period I would suspect that most cars were converted to SU fairly quickly. As you rightly point out I doubt if there is any such thing as a correct original J4 specification so if you are building a copy today such detail is really your choice. Thanks Terry as I was far from convinced by your initial post on the topic!!!! My thanks for the posts from the people I hold in esteem. I am going with the twin autopulse set up, in the main as to have a different set up from Cottinghams J4129 which was SU ( I have the original ) . email me direct re Autopulse. The J3 factory photos show an autopulse, the J3 manual refers to the autopulse and J3762 has been running an autopulse for 30 odd years (all be it a modern version). BUT, although I have never had a problem, the factory mounting location is off a bracket on the near side rear of the engine (using the water jacket side plate bolts), all nice and snug beneath the exhaust manifold!!! I have had plans for years to mount it in the rear which I think is a good move, especially with our modern fuels. I may leave the original pump in its original location (as a dummy, purely for originality looks!). Thankyou Ed, that is sound advice which I will be taking. Safety must be the overriding factor and if its possible to recreate an original type of layout in name only then I will be happy with that. It would appear that no actual photos, records etc have survived for the J4 which is my upgrade for J2353. J4129 even had a carbide lighting system fitted to the firewall, Cottingham must have fitted this to give him the extra lighting to service the engine bay, maybe whilst on trials or just as a breakdown lighting source. I have just received J4129s chassis from Cyprus via Liverpool Docks, repaired by an ex-Russian Army Pogram chassis repairer, I intend to rebuild J4129 using all the original parts I have, save the ash frame which is in very poor condition, the rest is pretty salveable.